Over the past few months, there have been a lot of disturbing reports of humans eating other humans (check: Florida, Canada, Brazil Russia, China). Are these just a series of coincidences or telltale signs of the looming apocalypse on 21.12.2012? According to robots, humans taste like bacon. Researchers at NEC System technologies and Mie University designed a robotic gastronomist capable of identifying wines, cheeses, meats and hors d’oeuvres. When a hand was placed under the robots jaw it was identified as “bacon”! Many cannibals consider the taste of human flesh to be similar to pork. One of the world’s most famous cannibals is Armin Meiwes from Germany. He achieved international notoriety for killing and eating a voluntary victim whom he had found via the Internet. In an interview from his prison cell, Meiwes says - "The flesh tastes like pork, a little bit more bitter, stronger. It tastes quite good.". Other German cannibals, Karl Denke and Fritz Haarmann, killed people and sold their flesh at the markets as pork. Interestingly, Germans eat a lot of pork. Actually, pork is the most popular meat consumed in the world with 85 billion tons consumed annually, a third more than beef or chicken. You know the saying “you are what you eat”… well if we eat a lot of pork, does this mean that we would taste like one too? Still not convinced by this human = pork hypothesis? There are also many similarities between humans and pigs. • Pigs are often used for dissection in biology labs due to the similarity between their organs and human organs. The internal organs of humans and pigs are alike not only in size, but also in physiology, so that insulin made from a pig’s pancreas can be used by humans for diabetes. There is also a lot research and trials been done at the moment on breeding genetically engineered pigs for the purpose of harvesting their organs for transplant into humans. • Pigs are highly intelligent and ranked fourth in animal intelligence behind chimpanzees, dolphins and elephants. They have great cognitive abilities, good memories, form social groups and exhibit similar behaviours to humans. For example, pigs are very clean animals, they are the only farm animals that make a separate sleeping den (which they keep spotless) and use a latrine area. Pigs can also be housetrained, taught to fetch, do tricks and play video games with a joy stick. Did you know that the term “long pork” is code for human flesh? I wasn’t aware of this until my friend told me that during the Soviet famine in the 1930s, situations of desperation, scarcity of food lead to people eat their fellow human beings and sell human flesh on the market as long pork in order to survive. Sounds like it could be our future after 21.12.2012? (Note: this came up in conversation because I was telling my friend that I was planning a series of apocalypse inspired dishes this year and brainstorming ideas). 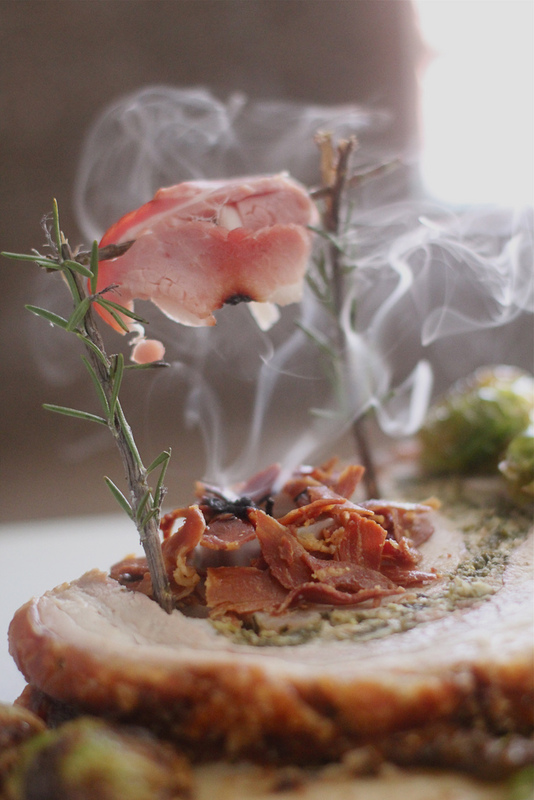 With this in mind, over the past few weeks I slowly came up with the concept for a pork inspired apocalypse dish. So here I present my second apocalypse inspired dish – it’s a “Pork Apocalypse”. Don’t worry I have not cooked any humans. 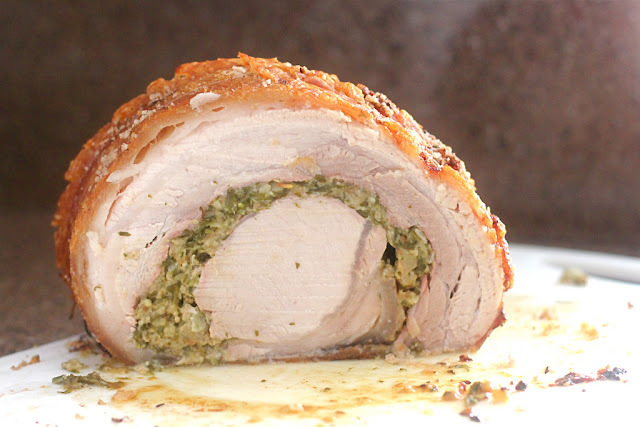 I’ve done a literal interpretation of long pork by slow roasting a stuffed rolled loin of pork. 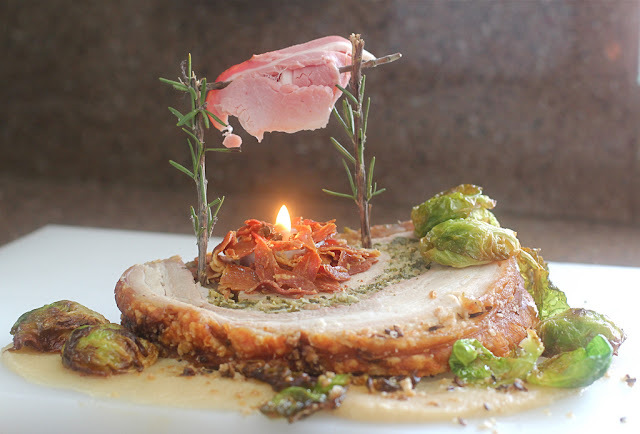 A slice of the pork is set on top of apple sauce with a camp fire cooking bacon, in desolate surroundings with the shrubbery of deep fried Brussels sprouts. My first apocalypse inspired dish was a "Mushroom Apocalypse on a Dessert". Take pork out of refrigerator and allow to come to room temperature before cooking. Combine all the stuffing ingredients together well in a bowl. 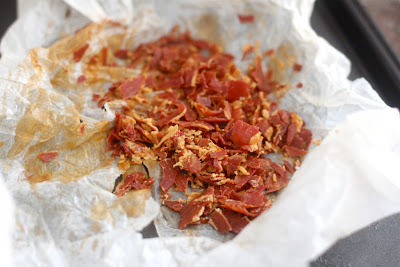 Pat dry the pork skin with paper towels and score the skin using a sharp knife at 5mm intervals in a criss-cross pattern but take care not to go through to the flesh (this allows the fat from underneath to bubble up, crisping the skin as it does so). Turn the pork over, skin side down and pack the stuffing into the pork cavity. Roll pork up to enclose stuffing and tie meat at 2cm intervals with cooking string to secure. Rub a little olive oil over the skin of the pork (I find that this helps the salt to stick onto the skin) and sprinkle liberally with salt (rubbing it in), fennel and allspice just before you put it in the oven. 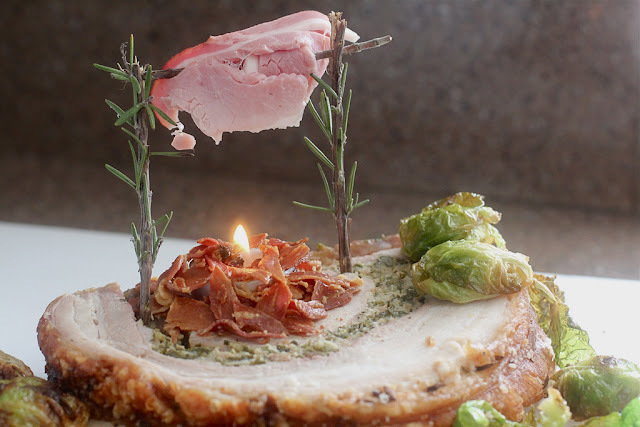 Place in a large, heavy-based roasting pan (you can elevate the pork on a roasting rack to keep it from sticking to the bottom of the pan and so that it cooks evenly because the heat surrounds it). Roast the pork at 220C for 30 minutes, then reduce temperature to 180°C and roast for a further 100 minutes (25 minutes for every 500g). Cook until the pork reaches an internal temperature of ~72-74C. Remove from oven and cover with foil and let it rest for 10 minutes before carving. This allows the juices to settle, which helps keep the meat tender and moist. 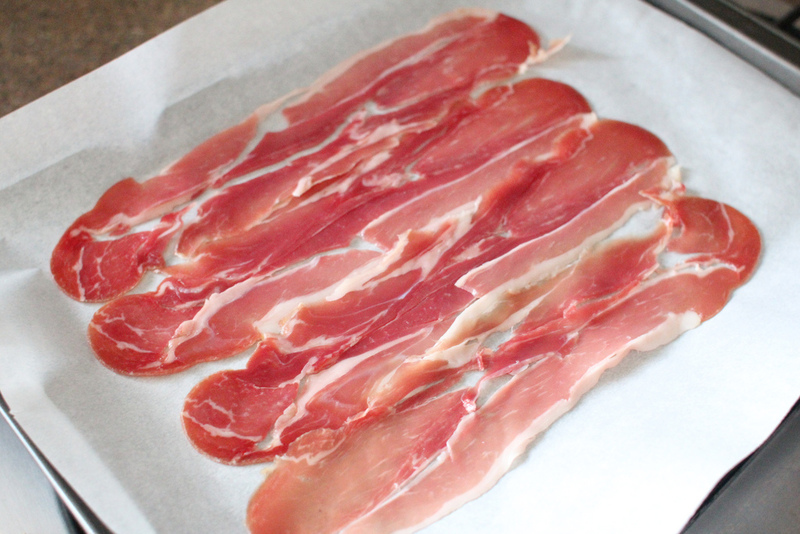 Cooked pork’s internal temperature will rise 3-8C after cooking and during resting so avoid overcooking. 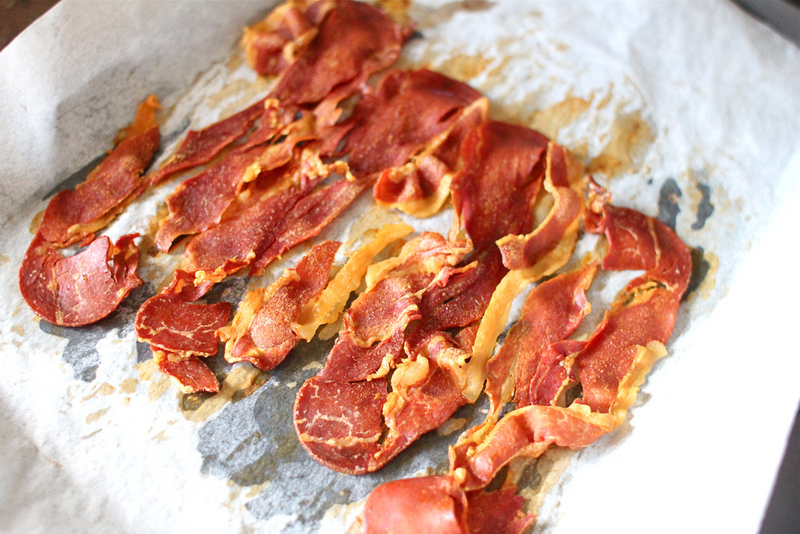 Remove the string, brush off the excess salt and carve into slices, each with a crisp layer of crackling. In a thick based saucepan, melt butter and stir in the sugar until it dissolves. Leave to cook until it becomes a light golden caramel colour. Add in the apples and give them a good stir to coat with butter. Add cinnamon stick, star anise and spices. Stir to combine and leave apples to cook on a gentle heat for ~10 minutes. Once the apples are cooked, place them in a small food processor and blend until smooth. Push the apple puree through a sieve to get a smoother consistency. Wash, trim and halve Brussels sprouts. 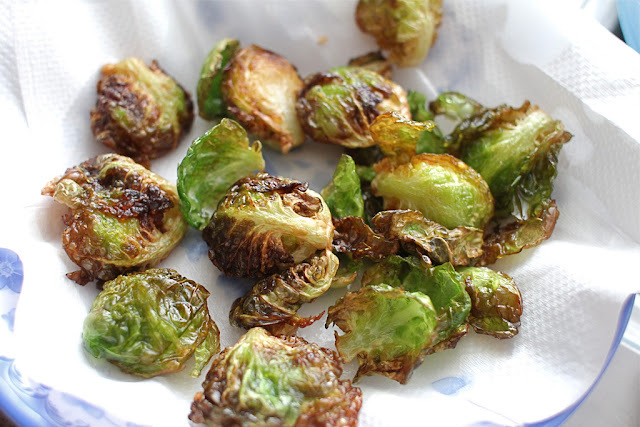 Preheat oil to 180C and deep fry brussels sprouts in batches, stirring occasionally until crisp and dark golden (4-5 minutes). Drain on paper towels. Tealight surrounded with wood chips made from prosciutto which had been roasted in the oven at 180C until it was dry enough to be crumbled into shards. Plus sticks of rosemary and bacon. I love this little ghastly scene. It's diabolical. Thanks :) I actually made some beetroot puree as blood but it never made it onto the dish. I will have to think of a bloody apocalypse inspired dish to use it in. Love it. If it wasn't for #trufflefest I'd probably go do some damage to some pork this weekend. Thanks :) I'm heading to the Truffle Festival this weekend too. Hopefully there will be some pork dishes served up! That is amazing! So creative! I showed the hubby, we are now having roast pork for dinner. I am sure it will look nothing like your masterpiece! Thanks Lise :) Glad you liked it and it inspired you to have pork for dinner. Your aporkalypse is both disturbing and foreboding yet making me hungry! Clever blue cookie! I think I'm happy knowing it MIGHT taste like pork but no desire to taste anyone's flesh at the moment. Love the little scene you've created though! This is an epic post! So much fun really!!! Ai Ling - your post has scared/startled/intrigued me! But darn it, that pork dish looks so goood!